Do you have many music on your iPhone/iPod/iPad? I suppose you may know, if you lose purchased music accidentally, you need to pay for them again if you do not have backup. To avoid music loss, you can consider transfer music from your iPod/iPhone to iTunes. You may be wondering how to transfer music from iPod to iTunes, and indeed it may seem like a straightforward process using Apple’s existing tools, but actually there’s a far better way. It gives you more control over your music will allow you to do a lot of things that you may not be able to do with just iTunes. Why You Shouldn’t Use iTunes to Transfer Music from iPod to iTunes? iTunes takes a long time to load, as it’s a bulky program. You may only be able to transfer some of your files, such as those that are in acceptable formats. You may be only able to transfer files that you officially purchased. You might lose files during the transfer. You can’t transfer individual files at a time. It only supports 5 iOS devices, which means you can transfer music from at large iOS devices to the same iTunes library. It is unidirectional transmission that it does not allow you to transfer data from iTunes to iPod/iPhone/iPad. The best approach to just transfer music from your iPod/iPhone/iPad is using a third-party iOS transfer tool that gives you a lot more control, like iMyFone TunesMate. You can edit your iTunes library without even having to mess with iTunes, which is much more efficient. 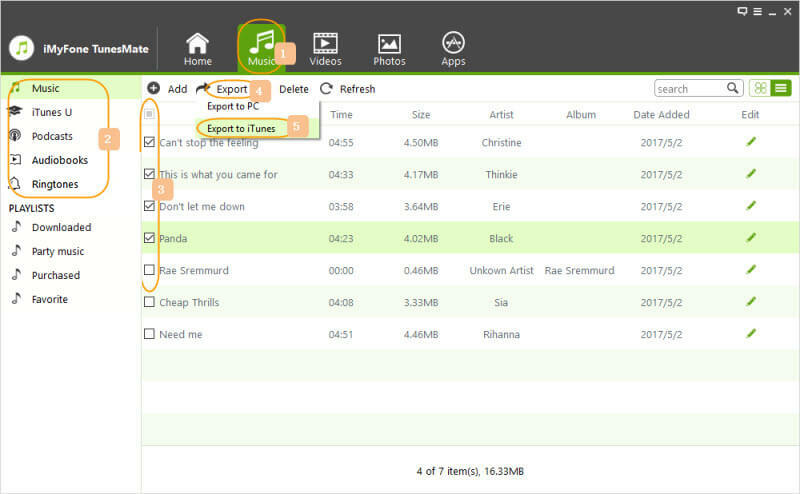 You can transfer the files in bulk or one at a time, and you can preview your music before you send it off. With TunesMate, it just requires a few clicks to transfer music from iPhone to iTunes library. Step 1: Launch iMyFone TunesMate from the official website. Plug your iPhone/iPod/iPad into your computer via USB. Step 2: Go to “Rebuild iTunes Library” and hit “Start” button to continue. 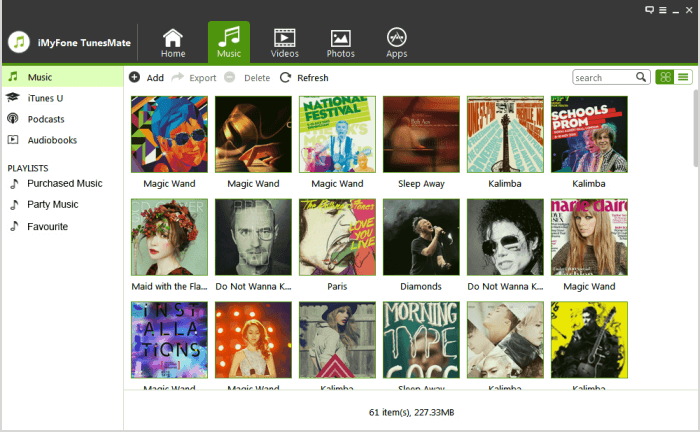 Step 3: If you just want to transfer music, uncheck other items and leave “Music” checked. Then hit “Start” to begin. Step 1: Launch TunesMate and connect your iPhone/iPod/iPad. Step 2: Go to “Music” at the top. Select music and hit “Export > Export to iTunes” to start. Both of these methods are very powerful and ensure that you won’t lose any of your data just because your music wasn’t an official purchase. It can avoid iTunes’ limitations. You can transfer purchases and non-purchased files. You can transfer all files or select files to transfer individually. You can transfer music to your iTunes from unlimited iOS devices. Your iTunes library will not be covered. You can transfer all the music from other iOS devices to the same device. In addition to these great features, you can also organize and manage your music on your device, transfer music to other devices, and transfer music to and from your PC’s hard drive. iMyFone TunesMate is an overall solution and you really won’t miss iTunes once you realize all that it can do. Music files aren’t the only type of file that TunesMate can handle, either. You can transfer photos, videos, documents, and other files. You can back up all of the stuff on your device with just a few clicks. you can preview before you transfer them back and forth between your computer and any of your iOS devices. You can use the software just to manage your files, too, and the interface is much more user-friendly than iTunes. You can do everything you need to do in a matter of seconds without too much trouble. So if you’re sick of Apple and all the restrictions that come with iTunes, then try something a little different and use iMyFone TunesMate. It works with every iOS device, including your iPod, your iPhone, or your iPad, and you can finally gain control of all your files.